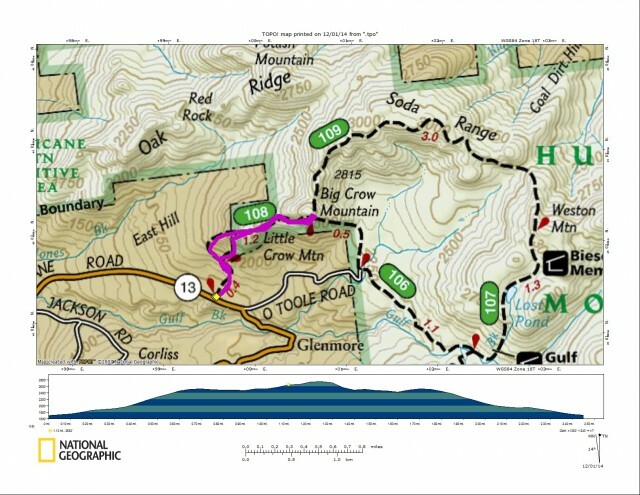 A late-day start on Thanksgiving eve brought me, Corenne and Emily to a long overdue revisit of two of the most attractive smaller Adirondack Peaks in the Hurricane Mountain Primitive Area: Little Crow and Big Crow Mountains. We started our hike at the Hurricane Road trailhead rather than the more popular starting point found at Crow Clearing on O’Toole Road. This trailhead is always pretty tough to find and after driving by it twice, I proved that point. A red trail disk on a set of wood steps is all that marks the start of this wonderful trail. With no snow on the ground and a periodic poking out of blue skies we left our traction in the car. Starting our hike we passed by the private residence that the trail closely skirts and entered the shelter of the hardwood forests behind the house. The first portion of this trail is over private property - where the landowners have so graciously allowed user to pass through on their way to Little Crow Mountain. 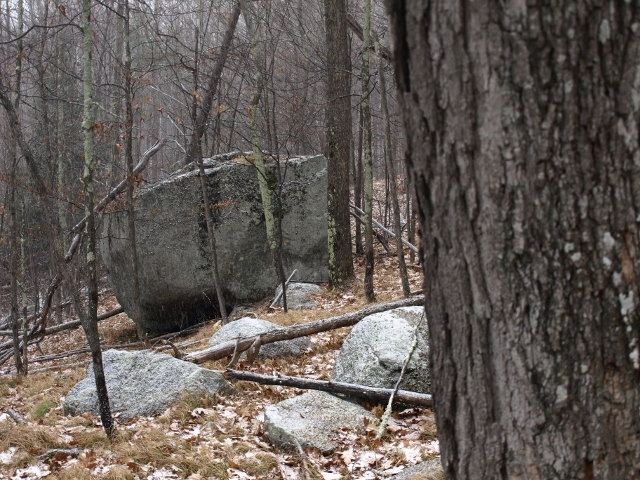 Soon the trail became more and more dotted with rocky terrain, and erratics could be seen dotting the landscape through the trees. Shortly, it all became slippery over the open rock tread we were on, making our stride and step selection a bit more concentrated. We soon found ourselves at the base of a larger cliff area when the smell hit me. 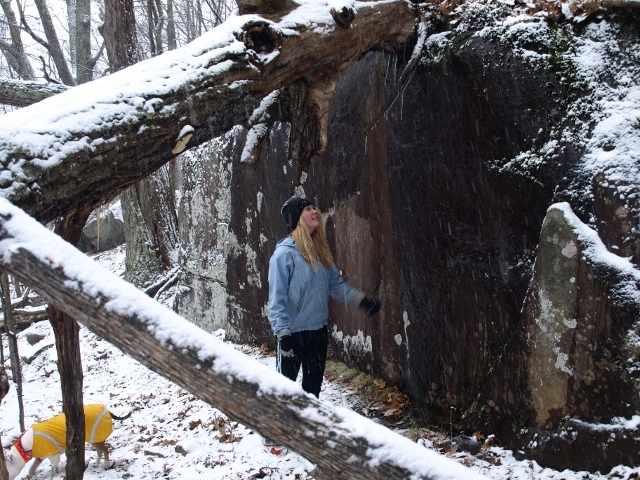 It was obvious that this was porcupine territory with cliffs, rocks, and small dens easily established within them, but also the hardwoods had been chewed a bit. The smell was the musk of a porcupine, undoubtedly. Of course I had my other hiking companion Abby with me, and dogs just don’t like porcupines. With a keen eye I watched for the creature, but never caught a glimpse, nor did Abby – although her nose was going a mile a minute. We passed by the blue trail which we would use as a descent route later. The terrain continued to climb aggressively and the trail was even icier as a light coating of snow put some powder over the slick areas, hiding them on us. A convenient natural stone staircase in one area was not quite as convenient with a coating of frozen snow melt; we had to make a side trip around this area. 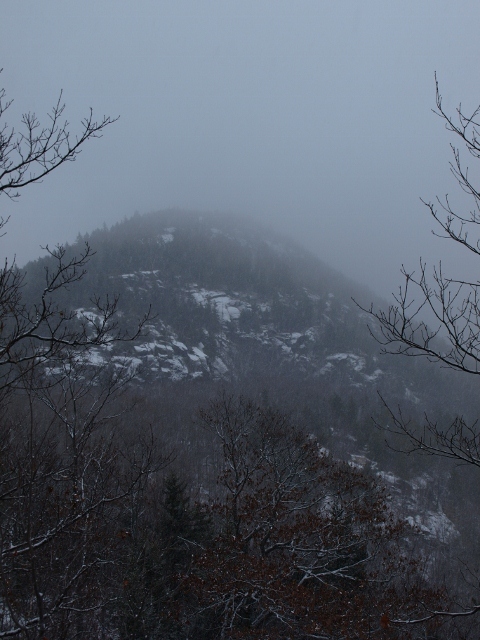 As we ascended Little Crow Mountain the snow began to fall a bit harder, removing any hopes of views from the cliffs and summits of the Crows. We summited Little Crow Mountain, but swiftly dropped over the edge into the special valley with Big Crow Mountain. This is a really unique valley, making words hard to describe it, you should plan a visit of your own. The ascent up Big Crow was a tough one. The terrain wasn’t so much the issue as the current conditions of the terrain. 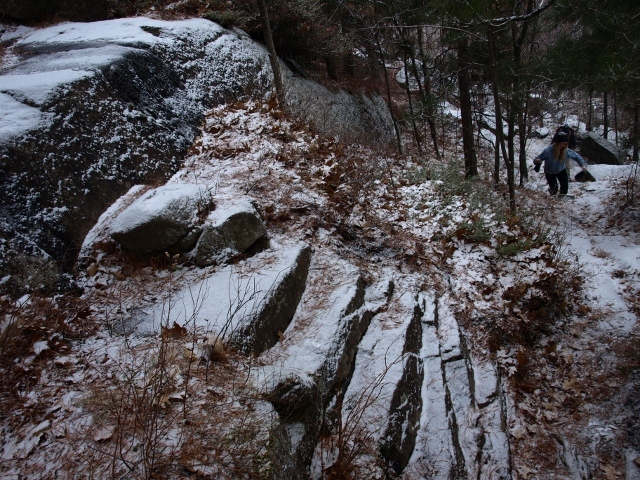 The ice on the rocky sections made travel come to a slow halt. Traction like Microspikes may have made a difference but truly, the ice was not that thick and the steel teeth may have been more of hindrance; we turned around. We were not sure how many years Big Crow Mountain had been there, but we were pretty sure it would be there again for another day. On our retreat we still decided to use the blue trail as a descent route; since the red trail was very slippery, how could it be much worse? We passed by the large cairn that marked the true summit of Little Crow Mountain, which is located in a fully treed location. The trail was very nice at first and easy to walk, but soon it would have to lose elevation. The grade of this trail, I would say, isn’t too much steeper than the red trail, but it had a much more slippery slope and no shelves to break it up. Emily took a good spill on the way down, figuring she slapped the back of her head on the rocks, I was concerned – she laughed it off as both Corenne and I shortly joined her looking up at the heavens. We had to retreat to the leaf-covered forest and the small sections of deep moss which were not yet frozen and offered an olive branch of protection from slipping. We eventually ended back up on the red trail at the intersection we saw on the way up. We finished up our hike thankful for not getting injured – perfect timing considering the holiday. Now for dinner! The ADK Café sat us down to a warm bowl of curry soup and a couple of club sandwiches. We were then convinced - under some sort of “Jedi mind trick” - to have some absolutely amazing plum pie. PLUM PIE! Who would of thought? The Whiteface Region is chock full of hiking and snowshoeing options for you during your stay - I bet we have something for you.